The new Martin Mac 250 Wash is equipped with remarkably efficient reflector technology for greater output, extraordinarily fast and quiet movement, a variable frost filter for zoom effect and a CMY color mixing system with a complimenting color wheel. Sporting the award winning traits of the MAC family, the 250 Wash features user friendly modularity and the sleek exterior design of the new 250 range. An extremely effective, multi-layered, dichroic reflector gives the MAC 250 Wash an exceptional output – surpassing its competitive peers using condenser based optical systems. A CMY (cyan, magenta, yellow) color mixing system provides nearly unlimited color choices while a separate 6 slot plus open color wheel compliments with color correction and other filters. All color slots are replaceable and split colors are possible. 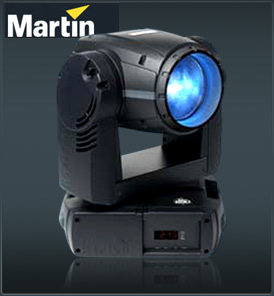 Using the latest fan technology the Martin Mac 250 Wash is an exceptionally quiet fixture. The head and base contain temperature sensors to ensure that fan speeds are kept to a minimum; bringing noise levels right down to suit theater and TV studio applications. Zoom effect possibilities are provided by a variable frost filter. The Martin Mac 250 Wash has remarkable speed of movement, paralleled with the new 250 family to ensure a well choreographed show both on stage and truss. An enhanced high resolution dimming system similar to the MAC 2000 provides remarkably smooth and even dimming, while a fast 20 Hz shutter for strobe effect is standard. A multi position, tilt lock mechanism is featured to permit easy maintenance and handling.